Historic Context: Roadside Development on Minnesota Trunk Highways, 1920-1960. Status: Intact, but in poor condition. Constructed: 1941, by the National Youth Administration. Design attributed to Arthur R. Nichols. Status: Restored ca. 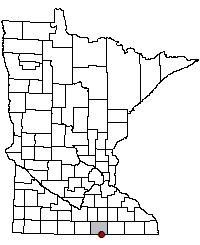 1995 by MnDOT. U.S. 65's crossing of the Minnesota/Iowa border is graced by the presence of two historic markers. 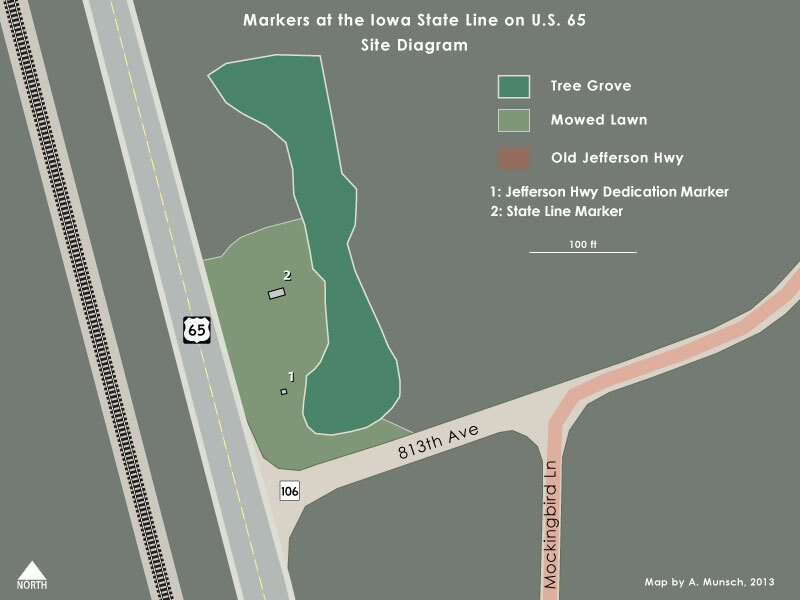 The smaller and older of the two is a grave like obelisk commemorating the completion of the Jefferson Highway across Iowa and Minnesota, dedicated by the governors of both states on October 28, 1930. The other more substantial structure is a rustic stone pedestal welcoming motorists to and from Minnesota, installed in 1941 by the National Youth Administration, a New Deal works program administered by the WPA. 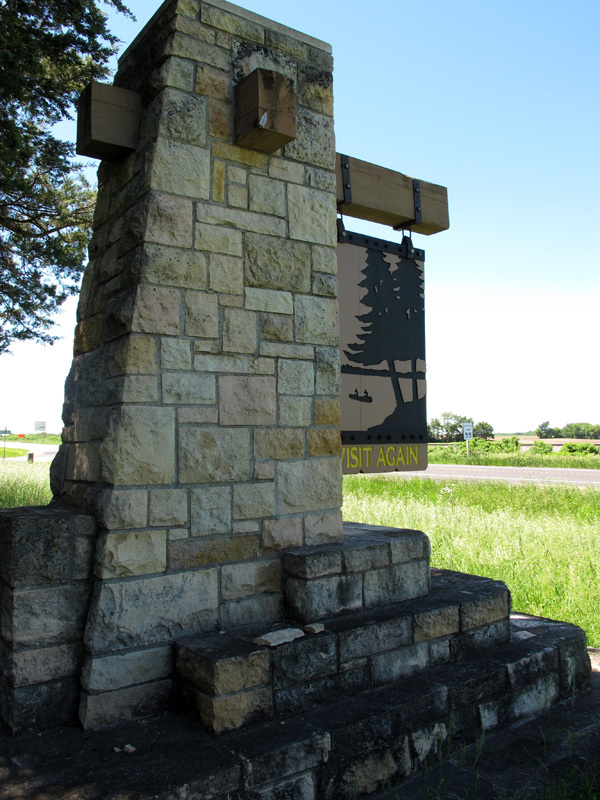 It was one of 18 stone markers installed on major border crossings around southern Minnesota at around the same time (16 of which survive). 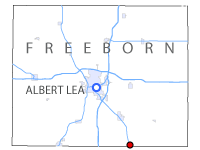 The road past the site is on the same alignment as when it was completed over 80 years ago as the first paved highway between Albert Lea and Mason City, Iowa. The two markers lie just 100 feet apart from each other on the east side of U.S. 65. There are no formal facilities here, but the lawn around the markers is kept mowed. 813th Ave (Co Rd 106) provides a convenient place to turn off the main highway and park without disrupting traffic. The historic location of the Jefferson Highway (as well as U.S. 65 and State Route 1) lies just to the east (see tour here). General view of the markers at the state line, looking north from 813th Ave (Co Rd 106). The state keeps the area well maintained and mowed. Close-up of the "IOWA" side of the Jefferson Highway monument. The monument is missing a few chunks of concrete and exhibits some orange lichen growth. Minnesota side of the monument. The "Welcome to Minnesota" marker as restored by MnDOT. Closer view of the pedestal. The sign and its the wooden beams are replacements (the original sign read "Department of Highways" instead of "10,000 Lakes".) Note the U.S. 65 marker in the background. South side of the marker with "Visit Again" for motorists leaving Minnesota for Iowa. Construction Plans: State Project 2404-01, April 26, 1941. Construction Project Log Record, Control Section 2404.